Every wedding day should be truly magical. The Royal Santrian resort in Nusa Dua goes out of its way to tailor personalised celebrations just for you. Filled with precious memories to last a lifetime, your wedding at The Royal Santrian promises to be one-in-a-million thanks to an incomparable setting and impeccable hospitality. 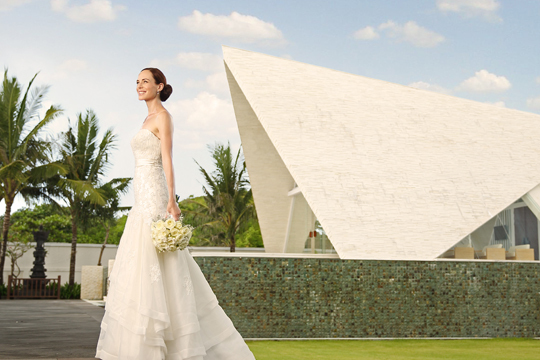 To experience a truly romantic ceremony venue in which to exchange your wedding vows, the Ulu Shanti Wedding Pavilion is bathed in natural sunlight. Commit to the tradition of true love before an intimate audience of family and friends. 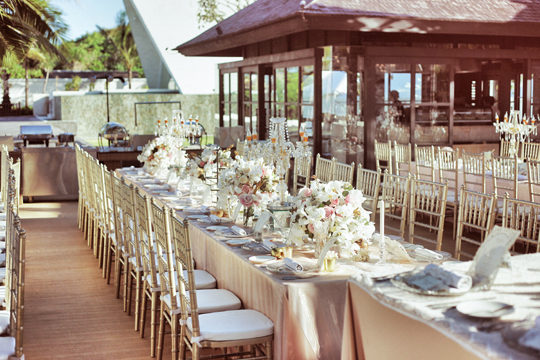 An expansive green lawn, set against the backdrop of Nusa Dua’s tranquil white-sand beach and sapphire-blue Indian Ocean, can be appointed with tropical hardwood tables and chairs as well as a stage for live entertainment beneath the stars. Topped with unique centrepieces, including customised floral arrangements and captivating accessories such as elegant birdcages, a professional wedding planning team is on hand to create the wedding of your dreams at The Royal Santrian.